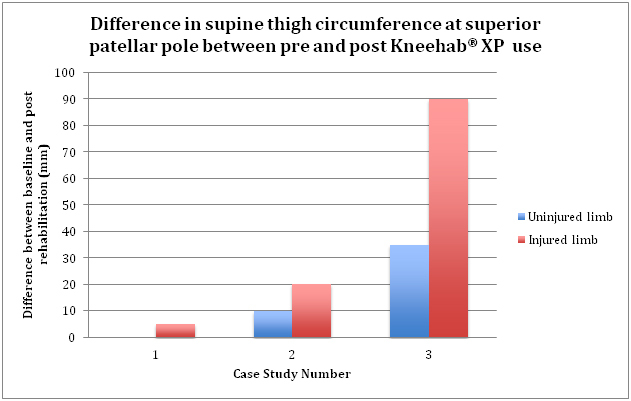 This report presents the results of a series of cases from people who have had knee injuries that volunteered to participate in an evaluation of the Kneehab® XP and met the inclusion criteria. Patients were invited to participate in the evaluation if they had sustained a knee injury or had knee surgery, had a measurable deficit in thigh cross-sectional area between the injured and uninjured knee, consented to be involved in the evaluation for a minimum of 8 weeks and agreed to complete pre and post evaluations. Kneehab® XP is an innovative, clinically proven neuromuscular electrical stimulation system, designed specifically for quadriceps (thigh muscle) strengthening and as a result, improving knee stability. Kneehab® XP works by strengthening and re-educating the quadriceps muscles through stimulation cycles of contraction and relaxation. The system uses Multipath™ technology to deliver comfortable electrical pulses through electrodes, attached to a comfortable garment, to the surface of the skin. These pulses trigger the quadriceps muscles to contract, helping to effectively strengthen muscles over time. Click here for a Product Information Sheet. If you would like more information on Kneehab® XP, please contact Neurotech on Locall 0845 600 1332 (UK/Northern Ireland) or on Freephone 1800 511 511 (Irl). If contacting from other regions, please visit www.neurotechgroup.com for further details. 28 year old male who sustained an ACL rupture to the left knee the end of January 2011 and underwent reconstruction surgery in May 2011. Started to use Kneehab® XP at 4 months post ACL reconstruction. The main goal for this patient was to return to sporting activity. 19 year old male who dislocated his right patella the end of October 2010. Since the time of injury the patient has experienced quadriceps weakness and patellar maltracking but has not had surgery. 27 year old male who sustained major knee injury in November 2010 and under went surgery to his left knee for multi-ligament reconstruction (ACL, PCL and MCL) in April 2011. Subsequently, the patient has been diagnosed with posterolateral rotary instability and was undertaking rehabilitation whilst waiting for surgery. The main goal for this patient was to maintain strength and function in preparation for surgery. 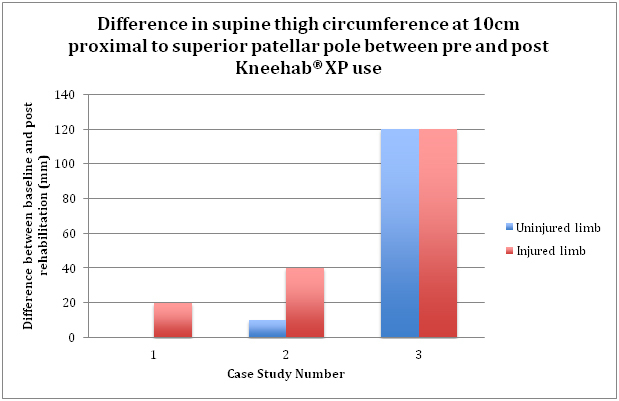 Injured limb increased in thigh circumference (superior patellar pole and 10cm proximal to superior patellar pole) for all patients. 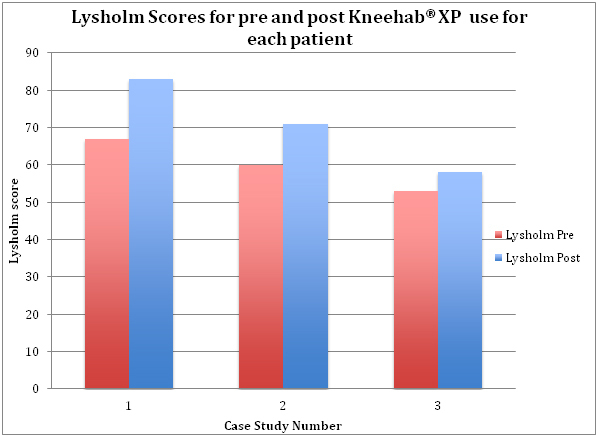 All patients experienced an increase in IKDC score and Lysholm score from pre to post use of Kneehab® XP. 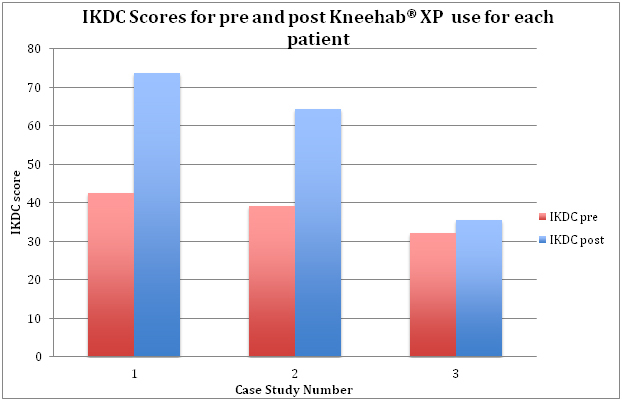 All patients were either satisfied or very satisfied with Kneehab® XP overall. All patients found Kneehab® XP either easy or very easy to apply. There was a mixed response regarding the comfort of Kneehab® XP with one person finding it uncomfortable, one comfortable and one unsure. All patients were either satisfied or very satisfied with Kneehab® XP instructions. When asked if they would recommend Kneehab® XP to a friend if they had a knee injury one patient strongly agreed, one agreed and one was unsure. All of the patients used Kneehab® XP each day for the majority of the days during the evaluation with only a few days with no use. The patients were able to use Kneehab® XP twice per day on most days and Kneehab® XP tended to be used once in the morning and once in the evening (usually before and after work). What did the volunteers particularly like about Kneehab® XP? They liked the ease of use and commented that they liked being in control of the settings and could make it more challenging if they felt it was appropriate. One person commented that they felt like they had properly worked the muscles in their leg, which they were not able to do otherwise due to pain or discomfort in knee. What did the volunteers particularly dislike about Kneehab® XP? The main dislike was the length of time they had to use it and that using it was a challenge due to the need to wear shorts or remove trousers to put Kneehab® XP on. One person commented on the fluctuations in power, as when the battery charge ran down they had to put the power up and then after charging they found they had to reduce the power again. Are there any changes that could be made to Kneehab® XP or the information to improve the product? One person suggested that it might be better to be able to pull on Kneehab® XP rather than using a strap system. One person suggested that a ‘shorter blast’ would make it more practical to use on a day-to-day basis rather than having to use for a 20-minute session. It must be remembered that all patients underwent a full rehabilitation programme so were receiving adjunct therapies and conducting rehabilitation in addition to using Kneehab® XP. In addition, two of the patients were post-surgery so would be expected to improve with postoperative time. A normative value for IKDC for a male aged 18-34 age is between 87 and 89.1 The three patients, although demonstrating an increase in IKDC score during the evaluation, did not achieve normative scores. This was expected for patient 3 based on that individual patient’s goals and is likely to be a reflection of the post-surgery rehabilitation timescales and that the rehabilitation is not likely to be complete for patients 1 and 2 at the time of the last assessment. 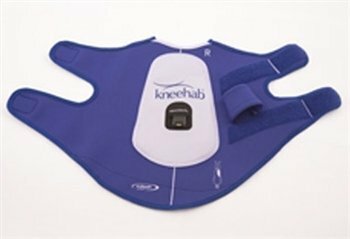 The therapists involved in this product evaluation found Kneehab® XP easy to use, and this simplicity made it easy to instruct patients for home use. The product also came with a clear instruction manual that patients could be directed to, should they forget any of the instructions. Anderson AF, Irrgang JJ, Kocher MS, Mann BJ, Harrast JJ, Committee MotIKD. The International Knee Documentation Committee subjective knee evaluation form: Normative data. Am J Sports Med 2006; 34: 128-135.